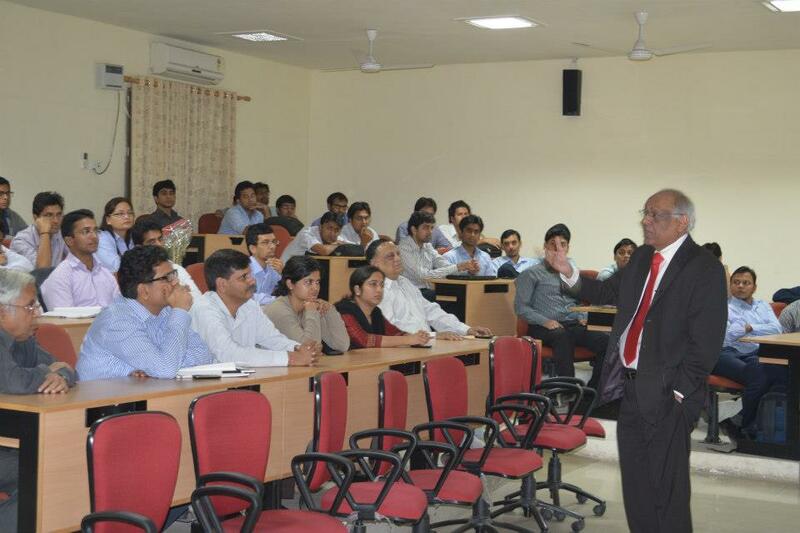 On the 26th of October 2012, the students of IIM Kashipur had the privilege of interacting with Mr. Anurag Goel (Member, Competition Commission of India). Mr. Goel joined the Indian Administrative Service in 1972 and has been Member, Competition Commission of India (CCI) for more than two years. He has rich experience of corporate governance and competition regulation, including nearly 3 ½ years as Secretary to the Government of India, Ministry of Corporate Affairs and varied earlier assignments in the Ministries of Finance, Home, Defence, Civil Aviation etc. He has also been Member of Boards of SEBI, DMRC, Air India, Indian Airlines, Airports Authority of India and a large number of other entities. He is also a member of the board of governors of the Indian Institute of Corporate Affairs. At the beginning of the session, Mr. Goel provided a brief overview of the CCI and the Competition Act, 2002. He described the role of CCI in making the markets work for the benefit and welfare of consumers. He gave examples of how the CCI had intervened to break anti-competitive agreements, such as the Cartelisation of Cement industry. He impressed on the students, the need for markets to be fair and free, which would aid the country in achieving faster growth and development. He also touched upon the need for competition policies to make sure that the scarce natural resources are used in the most effective manner possible. Mr. Goel was keen to spend most of the available time in interacting with the students, and hence he limited his session on the CCI, instead preferring to answer the many questions that the students wished to ask him. The students quizzed Mr. Goel on topics ranging from the role of CCI in Mergers and Acquisitions, to the implications of FDI in retail sector. While answering the students, Mr. Goel spoke of how Regulation needs to exist for promoting healthy competition and innovation, rather than stifling it. The students were also privileged to hear Mr. Goel talk about his efforts as the Corporate Affairs Secretary, in the Government intervention which helped save Satyam Computers in the wake of the corporate scandal in 2009. 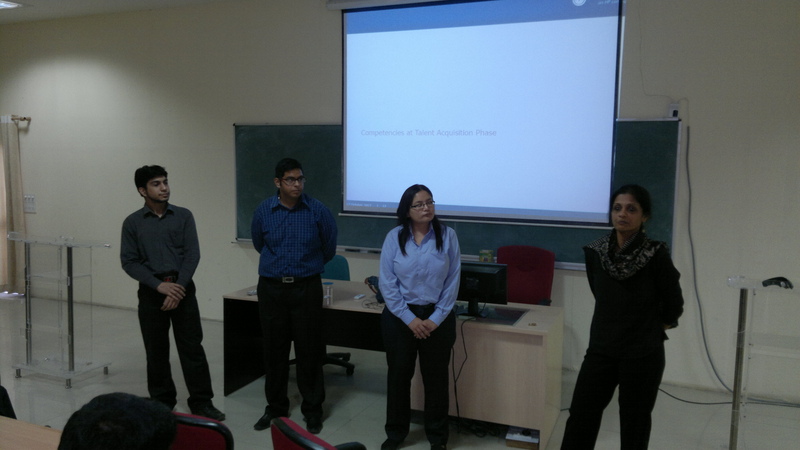 By the end of the session, the students had a clear idea of the important role performed by CCI. They thoroughly enjoyed the session, as it gave them an opportunity to interact with a stalwart of corporate governance in India. Interaction with Industry expert: Prasana Krishnan, Chief Operating Officer at Neo Sports Broadcast Pvt Ltd.
Mr Prasana Krishnan, COO at Neo Sports Broadcast Pvt Ltd. visited IIM Kashipur and shared his experiences in the Business of Sports. Mr. Prasana Krishnan has more than a decade of experience in the Broadcast Media industry during which he worked for the Times of India group before moving to his current firm, the Nimbus group, which owns two leading 24×7 sports broadcasting channels in Indian sub-continent – Neo Cricket and Neo Sports. He has also worked as a consultant with Arthur Andersen in the Power & Utilities practice. Mr. Prasana Krishnan drew attention to the peculiar nature of the sports business. In stark contrast to most other industries, the stakeholders of the holding companies try to maximise the performance of their teams, rather than trying to maximise their profits. Indeed, in no other Industry than the Football clubs of Europe, does the regulator insist on limiting the loss incurred by teams, as a financial fair-play mechanism. He also spoke at length on the irresistible lure of sports, which even attracts politicians of the country, who often preside the Governing bodies of various sports. Mr. Krishnan showcased the sheer scale with which the Sports Industry operates- Globally, it is estimated to be worth more than 600 billion US dollars. The sports infrastructure includes Infrastructure construction, Sports goods, licensed products and Events, of which Sports Infrastructure is the most expensive, often requiring generous funding from Governments. Later, Mr. Krishnan gave an overview of the Sports Value chain- which includes Rights Holders, Service Providers and Media channels. Mr. Krishnan described the various facets of Live production, and the technical prowess which makes available to us, a replay of cricketing action from the best angles, merely seconds after the original event occurs. He also enlightened the students about the financial side of the business- the risks involved in buying broadcasting rights. Mr. Prasana Krishnan cited a live example of how the purchase of IPL broadcasting rights turned out to be a stellar success story for Sony, whereas the Champions League T20 turned out to be exactly the opposite for its broadcaster. The students quizzed Mr. Krishnan on the threat faced by all Media Channels from Live telecasts on platforms such as YouTube. He spoke of the evolving nature of the broadcasting industry and of the possible opportunities brought about by the advent of technology such as YouTube and the Digitization of cable TV in India. 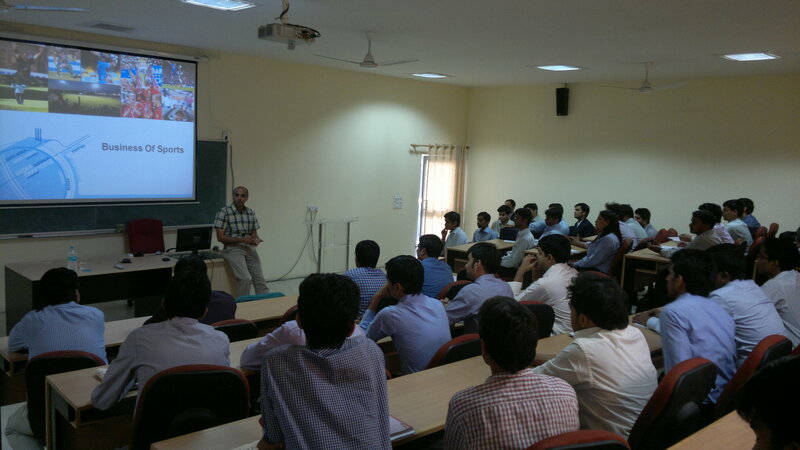 The students of IIM Kashipur enjoyed the lecture as they are now still closer to the Industry which rules their hearts. Ms. Usha Subramanian (Head- Graduate Hiring and Technical learning, MphasiS) spent a day with the students of IIM Kashipur. 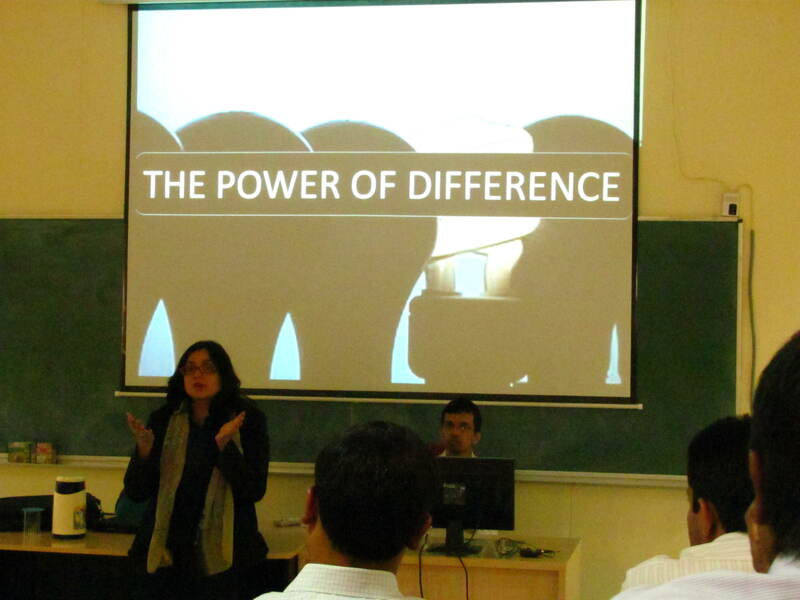 She conducted a guest lecture covering the emerging trends in Talent Acquisition among IT companies. Ms. Usha dons multiple hats at MphasiS. As the head of technical learning, she leads domain learning for multiple business units including the market units. Her team takes care of campus hiring and subsequent training of the graduates. She is also the head of HR Excellence and looks after HR policies, process governance and managing external and internal audits. Additionally, she is the HR CIO and manages system requirements from different HR functions. Interacting with the students of IIM Kashipur, she reminisced about the start of her career in 1989 as an administrator in Birla Institute of Technology and Science and her emotional connection to the field of teaching. She spoke of the need to have a risk-taking attitude, and mentioned how she and her husband ventured into unknown territory by launching an internet-based start-up during the tumultuous time of 2001. Having worked in both the academia and the corporate HR field, Ms. Usha compared the two fields and showcased the nature of the gap which exists between the students’ skill set and the expectations from the Industry. Students themselves drew on their prior work experiences in which they found themselves to be lacking in some aspect of technical competency as a result of flaws in the curriculum. Later, Ms. Usha conducted an impromptu session on the ‘Elevator pitch’. She asked 3 students to sell their favourite brands and then sell themselves effectively to a corporate head in 30 seconds. It was seen that the students did quite well in promoting their favourite brands, but came up short when asked to sell their own competencies. The result did not surprise Ms. Usha at all, for she has witnessed the same incident happening each time she conducts a session on the same. The students at IIM Kashipur quizzed Ms. Usha on the competencies required to make it as successful managers in the IT industry. In reply to this, Ms. Usha stressed upon the need for better communication skills and the ability to lead effectively by inspiring others. She also expressed the need to have a substantially more number of cases based on Indian context, as business scenarios depicted in Western case studies have a lot of cultural differences when compared to the actual business scenarios in India. She also provided the students with insights on MphasiS and its work culture along with the various career opportunities in MphasiS, such as its Future Leaders Programme. The students of IIM Kashipur enjoyed the session as it provided them with a clearer picture of what will be expected of them in the near future, as they step into the role of managers. Ms Lubna Khan, Associate Vice President & Strategic Planning Director, JWT interacted with PGP students of IIM Kashipur and shared her experiences in the field of advertising. J Walter Thompson (JWT) is the fourth largest advertising agency in the world with a strong presence in India, having started its operations in 1929. Since then it has been an acknowledged leader of the Indian advertising scene. It has continuously helped break new ground in advertising practices with a string of creative Ad campaigns to its credit. Ms Lubna Khan has more than fourteen years of industry experience, in which she has served as a cognitive behavioural therapist, a researcher, and a communications consultant, before assuming her current role of being a strategist. She has worked across a diverse set of categories, on some of the most recognized brands globally – Horlicks, Nestle Kit-Kat, Samsung, Microsoft, Nokia, Airtel, and LG. She has two postgraduate degrees in psychology, one from Delhi University and the other from the University of Leeds, UK. The interaction started with a screening of some ground-breaking ads which helped in creating a cult following for the products. With insights from the ads, Ms Lubna Khan dwelled on the pitfalls of ‘playing it safe’ attitude and how it causes failure of many a campaign in capturing the attention of the consumers. She explained the need for creativity to model perfect business solutions for the clients. Later on, Ms Lubna talked about her educational background and her role as a strategic planner in JWT. The students were also informed of the non-creative side of the Advertising agencies. The lecture left a lasting impact on the students as they developed a better understanding of the challenges involved in communicating brand image. Life was full of assignments, projects, presentations, surprise quizzes and I was eagerly waiting for some good news to have a short retreat from grinding life in IIM Kashipur. On one fine day, moments to rejoice had come with an internship offer from my dream company, Reserve Bank of India. Congratulations all around with friends started bashing, a common way of congratulating and parents wishing me all the best. Exhilaration subsided to half the levels as I would need to report in RBI, Kanpur rather than in Mumbai office. Being a south Indian, my Hindi speaking skills were very bad (better to say worst) and I had to spend 2 months in core part of Hindi speaking India. However, joy of getting an offer from RBI has allayed all the fears and scepticism. After taking a week long refreshing break at home, I started on a 26 hour journey to Kanpur. I had to spend first 2 days at my friend’s home as there was a bit of delay in allocation of quarters. First day of internship was an induction program where I was introduced to Regional Director RBI, my mentor and some other employees with whom I had to work. I was very excited after my first meeting with my mentor as he is very inspirational, work oriented and I always looked forward for an interaction with him. Other interns from IIM Lucknow, IIT Kanpur, IT-BHU and other colleges have started joining and we slowly started moving together. Interns were given 2-bed room flats (too big for a person to stay) in RBI officers’ quarters which are located in a plush area in Kanpur. Adding to the comfortable stay, quarters were full of activity with children enjoying summer vacation in the calm and undisturbed surroundings often engaging us in cricket and badminton. I was part of a team working on a live project to come up with suggestions to bring efficiency in government collections and payments. I had to conduct interviews to various stakeholders involved in the process along with an intern from IIM Lucknow. I enjoyed working with him and we shared views on various issues ranging from Currency system in India to Indian GDP. I got great amount of exposure in RBI as I participated in central level discussions on monetary reviews, gold imports, currency fluctuations which included deputy governors of RBI and other meetings with heads of State Government departments and national banks to discuss progress on financial inclusion and issues with electronic funds. I got a clear idea of how regulator thinks and should think as decisions taken at regulatory level touch all lives and enjoyed this experience in RBI to the fullest. Three things that I liked most in RBI were library, people and food. RBI’s library is a book lover’s paradise with books ranging from Indian culture to Indian currency in abundance. Employees (with average age of more than 50) were extremely proficient in banking knowledge and always guided me in my project. Hindi was never a problem in office as everyone can communicate in English and I have learnt a bit of Hindi (seriously not an exaggeration). Food in RBI was simply superb with around 12 different types of curries serving all palettes at the cheapest possible cost and lunch time was most awaited by one and all in RBI. Apart from these, never ending chats among interns at quarters, daily visit to rave-3 mall, a movie in a week, outings to Varanasi, Lucknow, Agra and Mathura made my sojourn in Kanpur the most memorable.